For Limited Time, get Nokia Music Express 5610 red and Nokia 5610 XpressMusic White for FREE. The Nokia Music Express is probably the most anticipated music phone from Nokia this year. Riding the success of music xpress 5310, this new music phone has even more advanced features, including both an MP3 Music Player and FM Stereo Radio. The latest Bluetooth Wireless Technology let you enjoy streaming Stereo via compatible Bluetooth headset. If the 1GB Memory Card that comes with phone doesn’t offer enough storage for your music collection, you can always expand it to up to 8GB. With all these new feature packed into a slider phone, it only weights 3.6 oz and the size is only 3.6 in x 1.9 in x 0.8 in. There is currently a $50 rebate from T-Mobile if you sign up a service plan. And it’s going to bring down the final cost to $0. That’s music to ears! Check out more free T-Mobile phones with cash back and bonus headets! Update: For a limited time, get $80 cash back today from T-Mobile! Update: Free out of pocket today. No rebates required! Nokia is one of most popular mobile phone brand in North America. The Nokia 3555 for T-Mobile can help you stay connected with family and friends without breaking the bank. Lose the wires and listen to your favorite music with stereo bluetooth headset or connect Nokia 3555 to your computer without any wires. Powerful 4X digital zoom lets you get close-up pictures without getting too close. Here is the goodie: The Nokia 35550 has attractive design and satisfying voice call quality. All instant messengers are included in the phone: Yahoo! AOL, and MSN. And this phone is compatible with T-Mobile myFaves services too, which means calling your favorite 5 people is always free. Price as of today is $29.99 at t-mobile.com. If you search harder on the Internet, there are a quite few good deals that offer the phone free out of pocket plus $80 rebate. 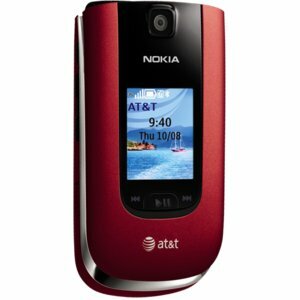 The Nokia N95 already comes in black and bronze, not it’s available in red. The price is still hefty – $699. Luckily it’s unlocked, so you can use it with any GSM carriers, AT&T and T-Mobile. With other Nokia phone such as the Nokia 5300 XpressMusic selling for $0 with a 2-year contract, it just doesn’t make sense to pay $700 for a phone. I personally like Nokia phones, but when it comes to smartphones, they never appleal to me or any large and smart organization in North America. First it’s the price point, with Blackjack II released last year that costs $0 after rebates and companies often paying for your Blackberry phone, who is willing to put down $700 for a device that is very likely to be outdated in 2 years?